This latest version of ISO 12647/2 standard printing conditions for offset litho was published in late 2014. The Fogra 51, coated, and 52, uncoated, colour datasets and the new CMYK ECI profiles made from these datasets, PSO coated v3 and PSO uncoated v3 Fogra52, were released at the end of last year. And yes, it is a little odd that the coated one does not refer to Fogra 51 and the uncoated does refer to Fogra 52! 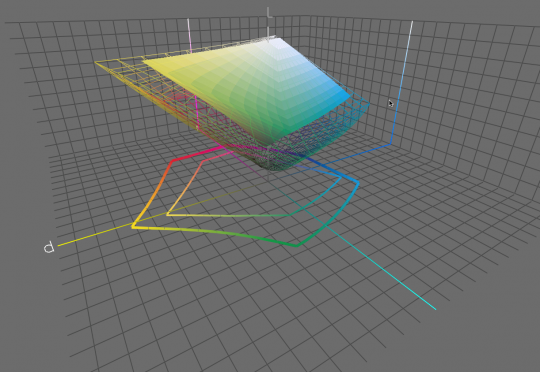 So now is a good time to look at the main differences between the older version of the standard ISO 12647/2-2004 Amd 2007, which used Fogra 39, coated, and Fogra 47, uncoated based CMYK profiles. I think it is fair to say, that at present there has not been a rush by printers and their clients to change to this new version of the standard and it’s associated new CMYK profiles. The main reason for this, IMHO, is that this new standard requires the use of M1 spectrophotometers, so the cost of this change could be high. Also many near line and in-line systems scanning spectrophotometers on presses do not yet support M1 readings. So I think this new standard may have a slow introduction over the next 2-3 years as instrumentation is updated. The reason that M1 spectrophotometer readings are now used for this standard and the CMYK profiles is that its is more accurate when measuring stocks with high optical brighteners (OBAs), used to make papers and board appear whiter and brighter. Most papers have this added. The M1 readings will also apply to proofs produced using these new profiles, to the ISO 12647/7 contract-proofing standard. Proofing papers will also need to be changed to reflect the OBAs in the production papers and the white paper point in the profiles. The other change to measurement is that De76 as the metric for measuring colour difference can be changed to De2000. It is also likely that in the forthcoming changes to ISO 12647/7 contrat proofing, De2000 will be the only metric used. De2000 is considered to be a more accurate method of measuring and calculating colour difference as it is weighted to reflect human colour perception. 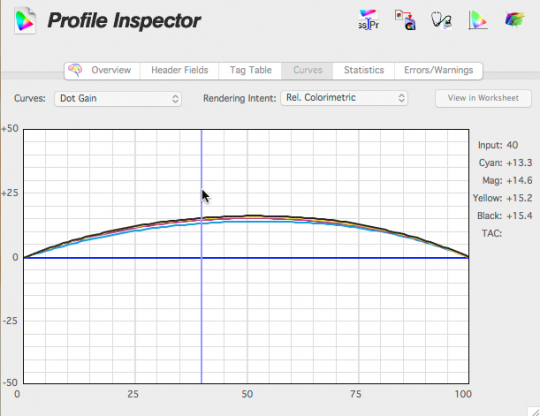 The changes from Fogra 39 to Fogra 51 profiles are slight. 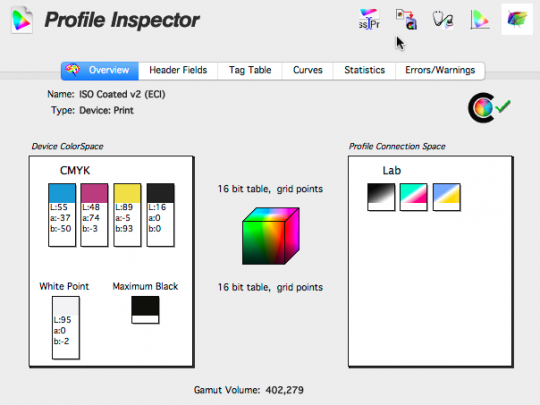 As can be seen from the screen grabs from Chromix’s excellent ColorThinkPro tool, using the ISO coated v2 eci Fogra 39 based CMYK profile and the new PSO coated v3, Fogra 51 based profile, there are small changes to the CMYK Lab colours, the largest change is to the paper white, which is now more in line with most ISO PS 1 premium coated papers. Please note that the figures in the screen grabs are from the datasets and profiles, and there will be a very small difference between these CIE Lab values than those quoted in the standard. 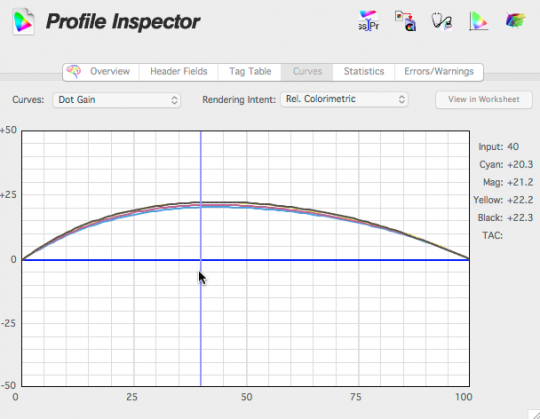 The TVI (dot gain curves) have changed, the curve shape has been amended in order, it is said, to match current Computer to plate workflows and press conditions more closely. Also all curves now have the same TVI figures, so no extra TVI is allowed for in the black. The Fogra 51 based PSO coated v3 use the new Curve A. Please note that the figures in the screen grabs are from the datasets and profiles, and there will be a very small difference between these TVI curves than those quoted in the standard. There are now 8 paper types in the new standard, covering most coated and uncoated paper types. The new uncoated profile, based on the Fogra 52 dataset, PSO uncoated v3 Fogra52 is based on PS 5 woodfree uncoated papers. 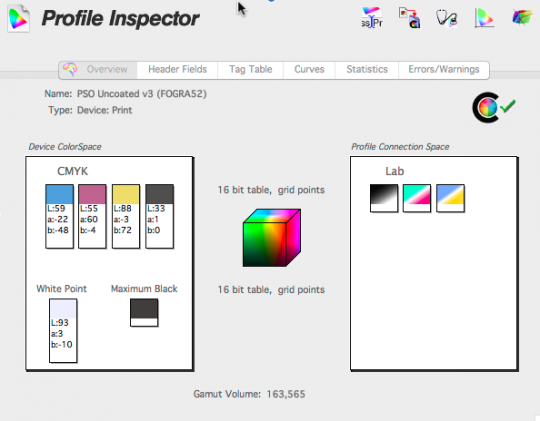 As with the new PSO coated v3 profile, the CMYK CIE Lab figures have changed a little from the previous Fogra 47 based uncoated profiles. The white paper Lab has changed a lot to reflect the very high OBAs often in this type of paper. 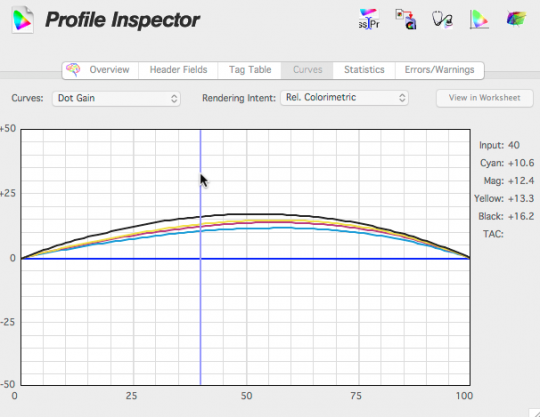 Again, as with the coated profile, the TVI curve shape has changed, and all four-process colours use the same TVI curve. Curve C is used from the new standard. So to sum up, I guess the change to this new standard will be market lead, as the new profiles do better match the papers in use by most printers. 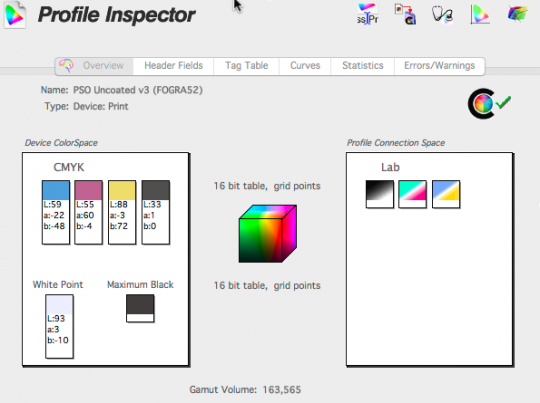 The major issue is not the use of these profiles within a colour managed workflow, but the investment in the new instrumentation for M1 measurement for both proofing and off-line and in-line production process control on presses that will be needed.